Eason Chan Yik Shun, Li Ronghao, Chris Collins, Wilfred Lau Ho Lung, Benz Hui Siu Hung starred in the Vincent Kok Tak Siu directed film KEEP CALM AND BE A SUPERSTAR (NGOR DAI GUI SING). Two nights ago a premiere was held. Eason revealed that during the shoot out of jealousy of Li Ronghao, Eason cried to the director. Eason joked that perhaps he was old and was particularly sentimental. Playing an action superstar in the film, Eason personally performed many stunts. 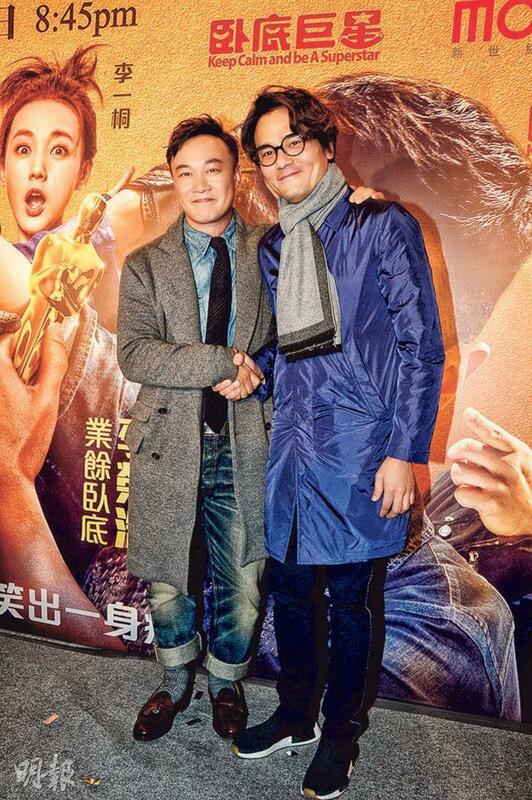 Kok Tak Siu said that Eason began training two weeks before the production began. When he started he first worked on fight scenes, so the later parts would be a little more comfortable. He thanked Eason for giving his all in many of the film costumes. Eason revealed that because Kok Tak Siu took great care of Li Ronghao, he was jealous and cried in front of the director. Kok Tak Siu immediately kissed him on the cheek. Eason said, "I haven't made a comedy in over a decade. I worried that I wouldn't be able to grasp the rhythm and lacked self confidence. I was acting up. Because during the shoot I took two weeks off for the Voice of China, when I got back I realized that the director loved Li Ronghao more. I got jealous. I didn't know why whatever I did was more trouble than it was worth. I pulled the director aside to talk, and I broke down as I talked. That never happened before. Actually that was very embarrassing. No only girls would be like this. Maybe because I am older I am a little more sentimental. My method was pretty fragile." Kok Tak Siu explained, "Because Li Ronghao is new, I just waned to give him more confidence. Eason just thought too much. I have always loved him a lot." Did Eason have a lot of action scenes in the film? He said, "To use real force, he had to learn to hold back. I understand that action actors would be very tired. I would rather get hit. When you get hit you only have to react. When you hit people you have to use a lot of energy, the rhythm is very important." Eason during the shoot got hurt. He said that toughest was the '720 drunken fist' on wire. He had to be on two wires, which spun him around as soon as he let go. He had to keep very straight. (Would he not dare to make another action film?) I can hold a gun, whether I would make another comedy it will be up to fate. Actually I considered this time for a long time. Maybe in the past two years I kept going on tour, I got bored with life. I didn't feel I was funny. Finally Director Kok convinced me. After making the comedy I really was very happy." Gordon Lam Ka Tung showed his support. Ka Tung said about Eason crying from the shoot, "I have done it too. Sometimes the script motivates the emotions. The director forces you to cry only because he loves you. He definitely feels you still have a lot of room and potential to bother to help you get there. I too look forward to see how the director 'squeezes' Eason 'dry', haha."